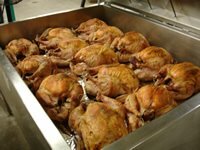 Although turkey is one of the most succulent of fowl, the white meat tends to dry out more quickly that other birds (chicken comes to mind before quail, capon, pheasant, duck, and ostrich). To many moist turkey is an oxymoron. Therefore turkey is usually served in some processed form. Thirty years ago while on a furniture buying trip to North Carolina we ran across a rib shack where the ribs were so moist we had to ask the secret. The chef not only told us his secret, he showed it to us. In the kitchen was a stainless steel box the size of a pickup bed with a lid. Inside were glowing red rods along the top and bottom of the box. A timer on the side controlled the intermittent infrared rays that do not rely on any intermediary to conduct heat - it works directly on the molecules in its path going directly from the source to the food being cooked. Thus the ribs were being cooked from the inside out, opposite from open flame cooking! The moisture was retained in the meat as it cooked from the inside out. Our chef not only cooked the ribs, he made the oven. Because we cook these 30 pound plump birds, we had a customized oven made to accommodate the additional height required. To our knowledge we are the only restaurant roasting turkey in this way. Maybe this is why I am too busy serving our customers to write this blog every day. Elkhart County has the largest percentage of its population employed in manufacturing in the nation. It also is one of the most fertile agricultural counties in Indiana. It has the largest milk heard and bales the most hay. With Amish Acres and several other major tourist destinations it ranks maybe second in tourism in the state. This combination is unheard of anywhere else. Three communities employ more people than live there. Although this economic diversity creates vibrancy, it also creates zoning problems that are not being delt with in a controlled manner. County government until now has not recognized this uniqueness and the coresponding unique zoning requirements to preserve the rural nature of much of the county and the smart growth opportunities surrounding our cities and towns. Therefore, we have been living under the utterly destructive 3 acre rule that is actually an exemption in our county zoning. Buy three acres from any farmer anywhere in the county and build a McMansion using the county road as a residential street. The county has become blotched by beautiful and productive farmland, much of it owned by generations of Amish, Mennonites, German Baptists and other plain people, turned into random, uncontrolled single family dwellings. This week less than 1/2 mile from Nappanee city limits sewer, and water, a farm has been carved into over a dozen plots of 3 to 4 acres and was auctioned off for unplanned development. Septic systems will be installed (our water table for the first time is showing traces of chemicals hazardous to our health), wells will be drilled drawing water from the same untreated source. To their belated credit county officials are bringing the subject to the table of how zoning affects our future growth, quality of place, and the ability to attract creative people to keep our prosperity alive and well. I know of no species in nature that fowls its own next, but there must be one because we couldn't figure this unintelligent system of land use on our own. 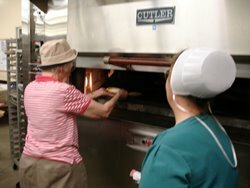 The Miller sisters, Ruth and Freida, have been cooking and baking at Amish Acres for a combined thirty three years! They bring their no nonsense culinary skills to Amish Acres famous Threshers Dinner and create a dining experience that echoes the farm family’s dinner table of a century ago. Now groups can come to Amish Acres bakery and make, bake, and take their own Shoofly pie. It’s the stickiest hands-on experience groups can get into. Sister Kathy is the redheaded whirlwind whose smile greats every bus of guests that arrive at Amish Acres. The Amish Adventure Elderhostel group is here this week taking in lectures and field trips that provide insight and education into the Amish society and culture. All twenty participants are Elderhostel veterans. Among the cities and eight states from where they hail, are included Orlando, Florida, seattle, Washington, Mill Valley, California, and Romeo, Michigan. Anne Johnson of Lincoln, Nebraska has experienced over fifty Elderhostels in the twenty years of the international organization's thirty year history. She has ridden freighters off of South American, but she never baked a shoofly pie! The first Elderhostel Bicycling group of nearly forty departs today after arriving five days ago and riding between twenty and forty miles a day through the countryside surrounding Amish Acres and Nappanee in Elkhart and Marshall Counties. Highlights included lunch in an Amish home, visits to an Amish country store, Mennonite Church, Goshen College, and a stern wheeler paddle boat ride on the St. Joseph River. They were treated to Threshers Dinner, Forever Plaid Theme Buffet hosted by the cast and company of The Round Barn Theatre, a haystack supper, yodelers, Plain and Fancy, Forever Plaid, and Amish Acres and Nappanee history by yours truly. Marlies West has mastered the details of these events. The group included novices and seasoned riders in a senior celebration of vitality and an enormous appetite to learn new things about different people and culture. They came from Webster Groves, Missouri; Monroe, Wisconsin; Rockford, Illinois; Evansville, Indiana; Columbus, Ohio; LaSalle, Illinois; St. Paul Minnesota; Lansing and Ann Arbor, Michigan; Warrenton, Oregon and Freemont, Sebastopol, Santa Barbara, San Diego, and San Francisco, California.